The Earth – Our home. The Earth is the third planet from the Sun and is the planet that we call home. It is the largest of all four terrestrial planets in our solar system and the name Earth came from the Anglo-Saxon word “erda”, which means ground or soil – or the Earth can also be known by its Latin name Terra. Earth is teeming with life and is home to millions of different species of plants and animals, the only planet in our solar system to be capable of supporting life as we know it. Earth is the planet that we know the most about, but there is still a great many things that we have to study and discover about our Earth. Read on for more fascinating facts about our home planet. More detailed facts about the planet Earth. In ancient times most cultures believed that the Earth was at the centre of the universe. It was only until the astronomer Copernicus in 1543 proved that the Earth moved around the Sun that this became an accepted truth. Similarly for hundreds of years it was believed that the Earth was flat until sailors travelled around the globe in the 16th century after which it was accepted that the Earth was sphere shaped. 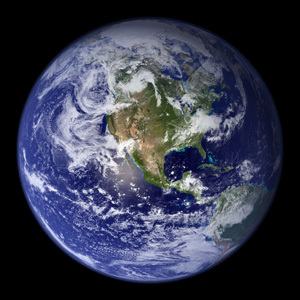 The Earth is the largest of our terrestrial planets which includes Mercury, Venus and Mars at a diameter of 7,926 miles and it is the third furthest away from the Sun at a distance of 94 million miles (150 million km). The circumference of Earth around the equator is 24,901 miles. 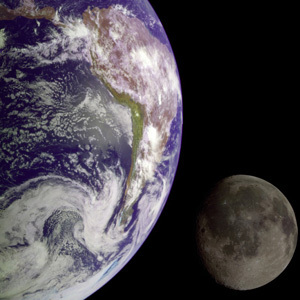 The Earth has one satellite, the Moon – the first of the terrestrial planets in order from the Sun to have a moon. Occasionally they pass in front of the Sun and this casts a shadow onto each other which is called an eclipse. The surface of the Earth is 70% water and 30% land. The Earth orbits the Sun once every 365.27 days and the orbital speed the Earth travels is averaged at 107,000 km/h. The Earth was formed 4.6 billion years ago. The plate tectonics that make up the outer crust of the Earth help to prevent a build up of greenhouse gases that ultimately made Venus the uninhabitable planet it has become over the course of billions of years. Earth is the only planet in the solar system with plate tectonics. These plate float on top of the magma inside the Earth and when two plates collide, one can slide under the other. It is this function that helps to sustain the planet because dead plant and animal matter develops into carbon over time and this is pulled into the interior of the earth and recycled rather than being released into the atmosphere as carbon gases which can cause the greenhouse effect. The earth is made from the following materials – 32.1% iron, 30.1% oxygen, 15.1% silicon, and 13.9% magnesium. Whilst the Earth’s core is made up of 88% iron and the temperature can reach 3,000 degrees C.
Statistically a year on Earth consists of 365.2564 days. This is why every 4 years we have a leap year (an extra day added to February) to catch up. The atmosphere on Earth is composed largely of nitrogen (78%) and oxygen (21%) with trace elements of other gases. The troposphere is the region in the atmosphere 12km above the surface of the Earth. It is in the troposphere that all of our weather takes place. Approximately 25km above the surface of the Earth is the ozone layer. This is a layer of ozone that protects the Earth from the Sun’s harmful ultraviolet radiation. The atmosphere extends as far as 500 km and the Earth’s magnetic field stretches as far as 100,000 km. The magnetic field is essential because it protects us from the Sun’s solar winds. We think of our days as 24 hours long, in other words the time it takes the Earth to spin once on its axis. Although a full day is timed at exactly 24 hours on our clocks documented in our calendars, the time the Earth takes to spin once on its axis is exactly 23 hours, 56 minutes and 4 seconds. The 24 hour period is actually made up by taking into account the movement of not only the Earth but also the movement of the Sun.